Why have your Carpets & Upholstery Cleaned? What is carpet cleaning all about? I must be one of the only carpet cleaners in Britain with an honours degree in Biological Sciences and I can assure you that carpet cleaning is not all about cleaning dirty carpets... Keeping clean carpets clean will help to keep your home healthy and your family safe and whether you are at home or in a place of business, if you haven't had your carpets cleaned in the last 24 months, you really need our help! University research has shown that properly maintained carpet promotes improved indoor air quality for your home, office and your family. Your carpets act as massive filters within your house as they trap the described pollutants which affect your indoor air quality. 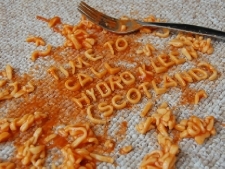 Every working day, we at Hydro Kleen work hard to extract these items from our customers' carpets. 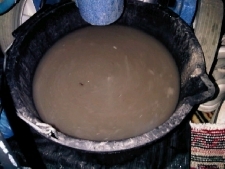 These soils and pollutants are in your carpets too and they need to be professionally removed. Regular carpet cleaning will result in a healthier home or work environment with improved air quality. If you need convincing, you only need to look at any leading Carpet Retailer's Carpet Care page on their website. Your carpets and suites are amongst the biggest investments you make in your home and the cost of having them cleaned is minimal compared to the cost of replacing them. Our rates make sense and our after care is second to none. We are confident that after you employ Hydro Kleen, you will never feel the need to use any other carpet or upholstery cleaner. On average, for every square yard of carpet in your home, there are 100,000 dust mites. A pillow that is two years old can be up to 10% dust mite faeces and corpses - YUCK!!! Dust mites live in carpets, upholstery, bedding and mattresses and their droppings are a trigger for respiratory problems in allergy sufferers including asthmatics. We provide a service that eliminates these nasties and keeps them at bay for up to twelve months. The product we use is a market leader in the fight against dust mites - perfect for a healthy home and great for asthmatics. Not only does this service kill the dust mites, it keeps them away for up to 12 months. Add to this that we will be rinsing your carpets with one of the safest cleaning products on the planet and you can be assured of allergy friendly carpets once the work is complete. Legionella pneumophila to name but a few. STRONG - Independently tested against the H1N1 virus amongst many others. SAFE - Safe for humans and works on a nanoscopic scale similar to the virus. ENVIRONMENTALLY FRIENDLY - Has no significant environmental impact. SURFACES – The product has 4 biocides and a polymer backbone which offers ongoing residual efficacy (works for weeks/months after application). WET or DRY - The unique hydrophobic properties allows our product to work on wet or dry surfaces. HANDS - Tested to EN1500 with 30 minute to 16 hours control and outperforms leading alcohol and triclosan brands. This is a highly specialised treatment that is perfect for both domestic and commercial premises. Call us to find out more about how we can protect you from infection in your home or place of work. Dealing with textile pests that inhabit your carpets is a highly specialised task that should only be entrusted to fully trained professionals. At Hydro Kleen, we have been trained to deal with these circumstances and we are one of the few companies locally that are fully qualified and licensed to deal with this. This is applied safely using full personal protective equipment and will kill each of these at every stage of their metamorphosis. As a biologist, this is a great thing to be able to do and it helps us to help you take control in your property. Hi, we are Lindsay Russell and Stephen Lynch - your Hydro Kleen Services Ltd carpet, rug,upholstery, leather and stone floor cleaning team and we guarantee that when you use our services, we will not leave your property until we have exhausted all means at our disposal to remove every last spot and stain from your carpets, upholstery & leather. Even if it makes us late for our next appointment! When you call us, you will begin the process to experience the most thorough stone floor, carpet, upholstery & leather cleaning you have ever seen or it's free.